Defending champion Ronnie O'Sullivan beat Barry Hawkins 17-7 with a session to spare to reach the World Championship final. Beginning the evening six frames ahead at the Crucible, the five-time winner extended his lead with a break of 76. 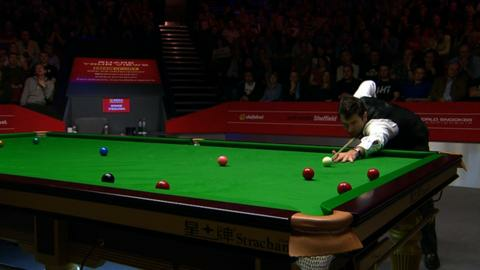 O'Sullivan, 38, will meet either Neil Robertson or Mark Selby in the final. 'The Rocket' punished the mistakes made by Hawkins to give himself a day off as he recorded breaks of 76, 55, 103 and 84 in the evening session. O'Sullivan beat Shaun Murphy 13-3 in the quarter-finals and Hawkins was to fare only slightly better. The Kent potter had started the morning trailing 6-2 after conceding the final four frames of the first session against the man who beat him in last season's final. Although he lost the first four of the day to slip even further behind at 10-2, Hawkins finished it with a terrific 106 to close the gap to 11-5. However, he could not maintain it in the evening and had a highest break of just 67. "To have got such a comfortable result against Barry is great for me," said O'Sullivan after securing a place in the world final for the sixth time. "I hadn't played for two months going into this tournament so I'd got a bit bored of practising, but that's because I didn't enter any tournaments so that's my own fault. "As each match goes on you do feel like you get into it."